The nutritional status of older adults tends to deteriorate during hospitalization, regardless of their nutrition status upon admission. Without adequate support at home following discharge, older adults have a higher risk of death compared to those that are well-nourished. Individualized nutrition interventions from a registered dietitians can improve nutritional status and health outcomes in older adults receiving home health care. 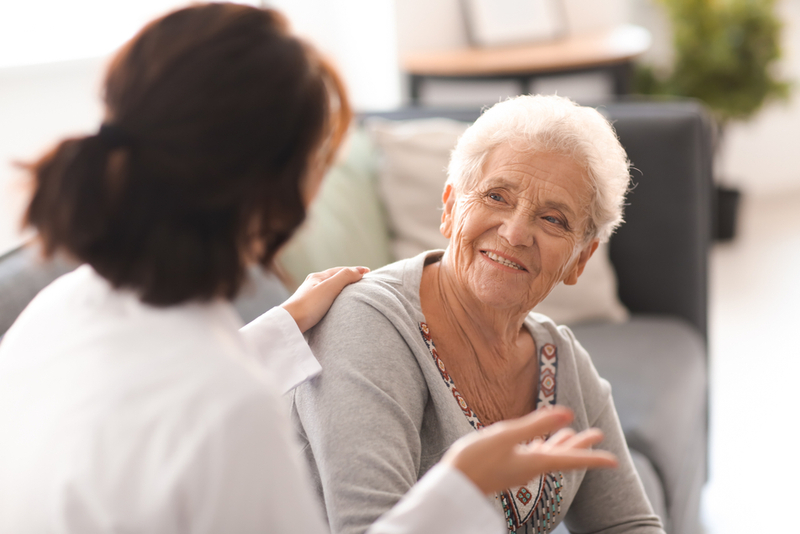 Home health refers to medical treatment and assistive care for people who do not require hospitalization or long-term facility care, but require additional support at home. Home health services are offered by Medicare-certified home health agencies under the Medicare home health benefit. Home health care is typically less expensive, more convenient, and as effective as care given in a hospital or nursing home. Home health also allows older adults to age in place and receive care at home rather than in an institutional setting, and can reduce acute care use and the costs associated with preventable hospital visits. (1). Most people receiving home health care are over 65 years old, and require assistance with activities of daily living such as eating, bathing, and transferring in and out of bed. As an integrated member of the interdisciplinary team, dietitians help ensure that home care provided is comprehensive, coordinated, and of high quality (2). Dietitians determine nutrition risk of home care clients, and develop a individualized plan of care. Research has shown that when older adults receive individualized nutrition interventions from a dietitian following hospitalization, they have a lower risk of death and improved nutritional status (3, 4). These interventions many include nutrition support, medical nutrition therapy, and therapeutic diets. Nutrition support allows patients to be discharged to home or residential care who previously would have remained in the hospital. Dietitians have the training and knowledge to initiate and manage nutrition support, which includes enteral (tube feedings) and parenteral nutrition (intravenous nutrition). They also provide nutrition-related training and education to caregivers for managing nutrition support (5). Complications in patients receiving long-term home tube feedings can include tube-site complications such as discharge from tube site, red stoma, and granulation tissue (6). Mechanical or technical issues related to tubes plugging, breaking, and falling out are also common. That said, dietitians are in the unique position to participate in the management of tube feedings, provide support and education to patients and their families, as well as evaluate and monitor treatment to promote better outcomes (7). Medical nutrition therapy (MNT) is an evidenced-based medical approach to treating and managing certain conditions through individualized nutrition care. Registered dietitians can provide MNT services when referred by a physician. MNT can reduce disease risk, complications from disease, and help lower overall medical costs associated with certain chronic conditions, specifically type 2 diabetes and chronic kidney disease (8). Medicare Part B may cover MNT services and certain related services for people with diabetes or kidney disease. A therapeutic diet controls the intake of certain foods or nutrients. It’s a modification of a regular diet that may be modified for nutrients, texture, food allergies, and food intolerance. If a client has a therapeutic diet, a dietitian should be involved in the care plan to monitor effectiveness of the diet, and provide diet education to the patient and caregivers for increased dietary adherence. This is especially important as diet instructions have been found to be more effective when given at home than when given in the hospital. Research has also shown that home-visit nutrition education by dietitians can improve nutritional status and health outcomes in older adults (10). Aging is often accompanied by many physiological and pathological changes that make it difficult for older adults to meet their nutritional needs (11). Poor dental health, declining appetite, and chronic diseases are a few of the largest factors affecting nutrition in older adults. Other factors may include swallowing difficulties, diminishing senses of taste and smell, or an inability to independently shop and cook. Collectively, these factors put older adults at significant risk of malnutrition, and can lead to poor health outcomes if appropriate interventions aren’t in place. Dietitians are uniquely trained to identify nutrition risk factors in older adults, allowing for quicker and more effective interventions. As people age and live longer, more of them will have multiple chronic diseases, like heart disease, diabetes, and kidney disease. They will also face functional impairments that affect their activities of daily living such as eating, bathing, dressing, and shopping or cooking. As an integral part of a well-coordinated multidisciplinary team, dietitians are essential for delivering person-centered, evidenced-based nutritional care to people receiving home health care.